1. We not only want to abolish Article 4 in the Constitution, but also to have a Constitutional Congress to establish a new constitution that truly reflects the will of our people, not the will of the communist party as currently in the constitution in force. 2. We support a pluralistic and multi-party system, and all political parties who fairly compete for the advancement of freedom, peace, and prosperity of the people of Vietnam. No political party has the right to control, and to tyrannize this nation. 3. We not only support a democratic system which upholds the independence of the executive, the legislative and the judiciary, but also wish for a government that decentralizes its power by empowering the autonomy of local levels of government, and eradicates the state-sponsored consortium, and all state-owned corporations, which misuse national budget, breed corruption, destroy the people’s faith, will and the spirit of our national unity. 4. We support for the military becoming non-partisan, free from the party affiliation. The military is to protect the people, the land, and defend national sovereignty, not to serve any political party. 5. 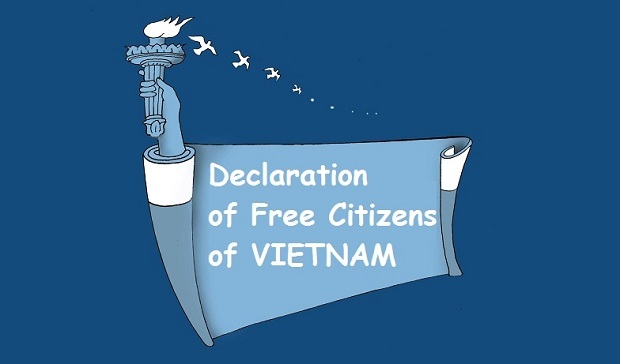 We assert the right to declare the above and that all our fellow Vietnamese citizens share the same right. We affirm that we are exercising our fundamental human rights which constitute the rights of free thoughts and free expression. These are natural rights that are inherent in every human being at birth. The Vietnamese people recognize and respect these universal rights. These rights are not granted to us by the Communist party and hence, the communist party has no right to dispossess us of them nor to judge them. We deem any judgment or accusation aimed at us an act of defamation. We believe anyone who opposes these human rights is also against our national interests and mankind’s civilization.